In case you’re not sure what I’m talking about, musical articulation is what we call all of those random symbols, like staccatos and accents. They affect the way you play a note, or notes. My goal today is to keep this video short, snappy, and to the point. Same goes for the following blog post – you can use it as a reference if you’d like! What does articulation mean with language? It means speaking clearly and pronouncing your words properly. It means following general sentence structure, and inserting breaks and commas in the right place, as well as taking breaths at the end of a sentence (and not halfway through a sentence). Music is a type of language – completely unique to spoken languages, but a language nonetheless. So it’s important that we notice and perform all the piano articulations, instead of ignoring them all and just playing the notes, and nothing else. Articulating your music is the difference between someone who mumbles incoherently, and someone who speaks clearly and effectively. Slur: Also known as the Swoopy Line. 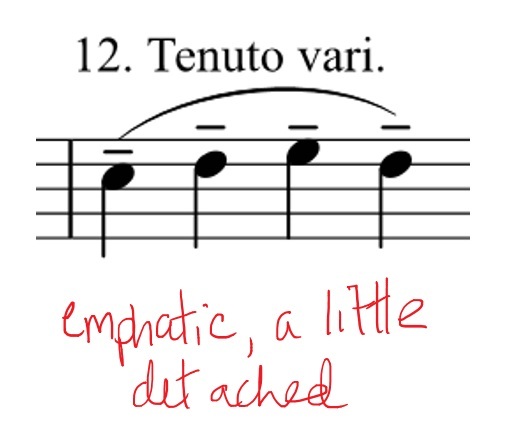 It means to play smoothly, not choppy. 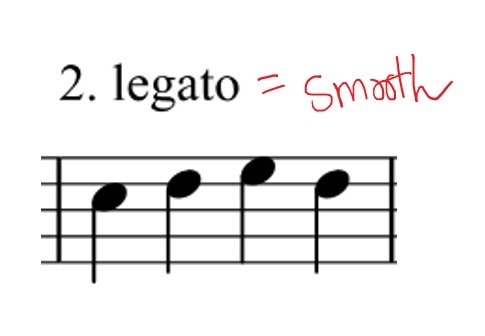 When you play a slur, you’re playing legato, which is Italian for smoothly. You’ll see that word a lot. Phrase: Phrases are marked by slurs. They’re musical sentences. 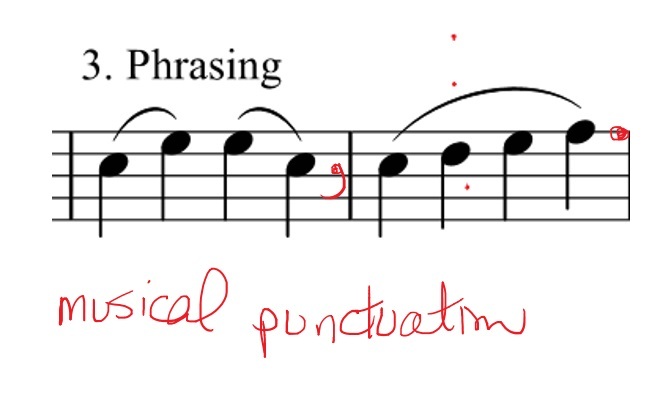 Create a break in the sound between slurs to mimic punctuation. 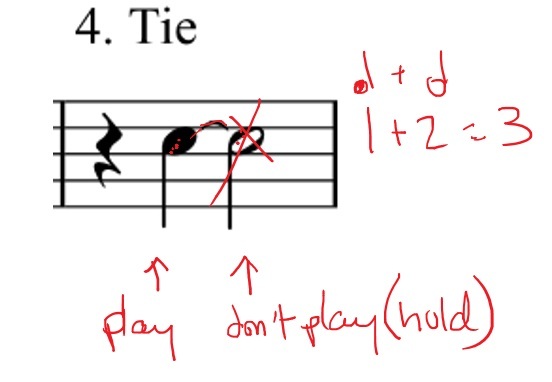 Tie: Connects two notes. You play the first note, but not the second. Instead, you hold for the combined total of the notes. 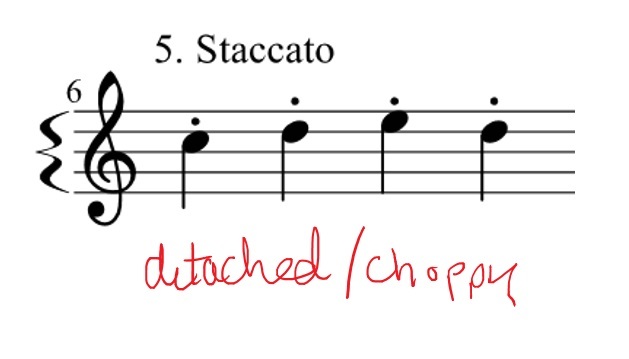 Staccato: Lift up your fingers quickly. The notes are on fire! The opposite of a slur. 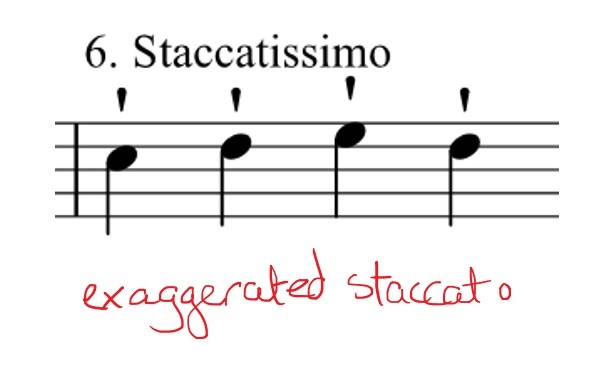 Staccatissimo: An exaggerated staccato. Keep ‘em choppy, but distinct. Portato: They look like staccatos, but there’s a slur. Smooth or choppy? What is it? Kind of both. 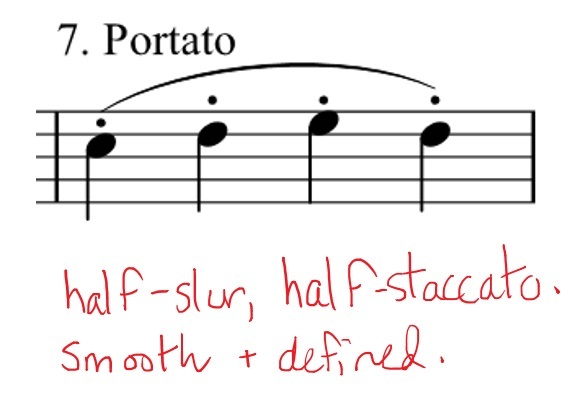 You play the staccatos more smoothly, but keep the notes more defined than a slur. 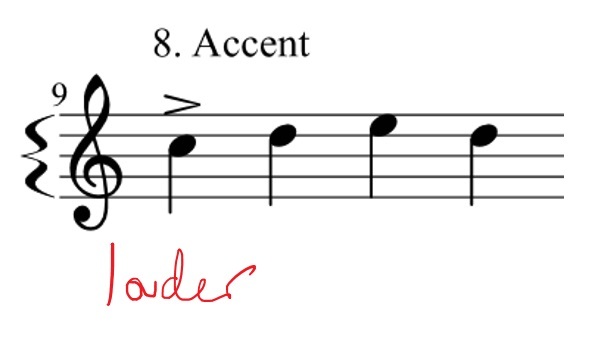 Accent: A regular ol’ accent. Play this louder and more forceful than the other notes around it. 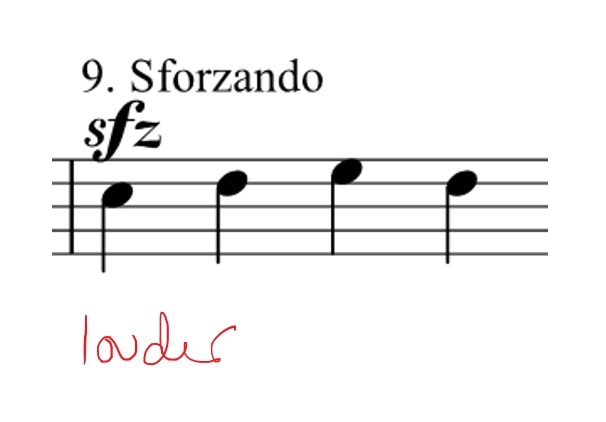 Sforzando: sfz, sf, fz: Means “forced”. Basically the same thing as an accent. Play it louder. 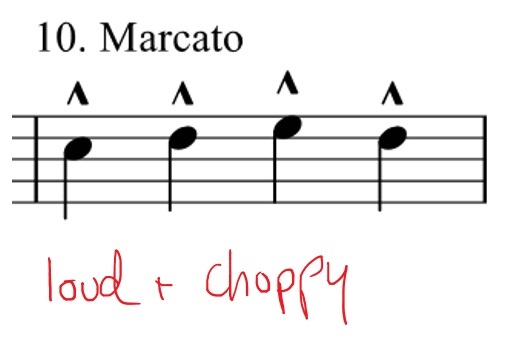 Marcato: This is like if an accent and a staccato had a baby. Keep it choppy, but louder and with oomph. 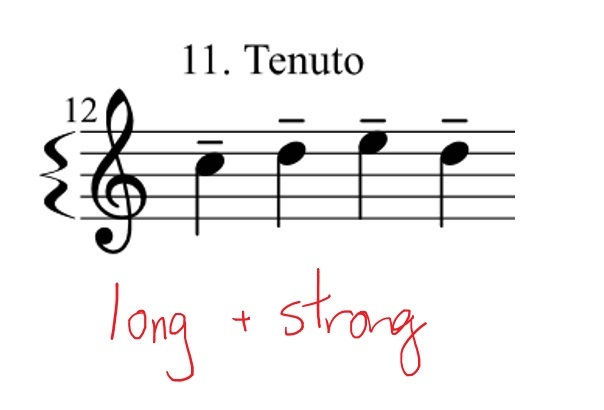 Tenuto: Not just one answer for this bad boy. I like to think of it as “long and strong”. Hold it as long as the note value, and play it strongly. If you’ve got several tenutos in a row, especially with a slur, you want to keep them a little detached from each other. Read: Not smooth. More like deliberate and emphatic. Fortepiano: fp: A type of accent. 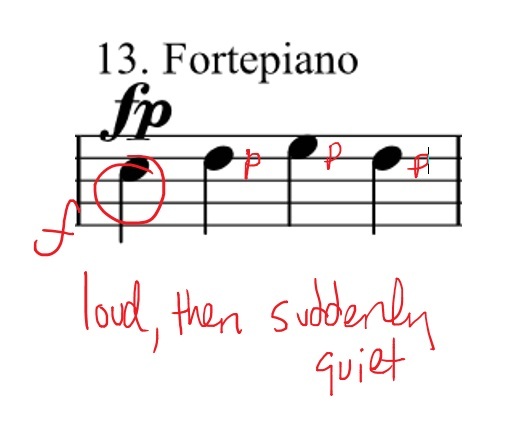 Means just what it looks like – play the note loudly, but the next note quiet (forte = loud, piano = quiet). 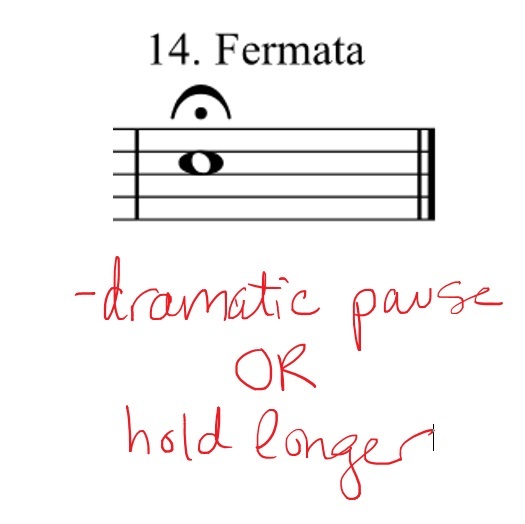 Fermata – Stop and pause. Stop counting. Be dramatic – hold us listeners in suspense. Or, let the note trail off into nothingness. I hope you enjoyed this roundup of the various music signs and piano symbols that make up piano articulation. There are many, many symbols in the piano sheet music world, and this is just a small selection of them. In the future, perhaps we’ll talk about other symbols – let me know what you would like to see!